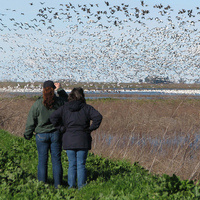 This annual event, which takes place in the heart of the Pacific Flyway, the migratory route of various birds, features a wide variety of wetland and bird field trips, workshops, and activities for everyone! Field trips are led by some of the region’s most experienced birders and naturalists. On-site activities for families include interactive exhibits, wetland themed arts and crafts, trout fishing in our ponds, visits with live ducklings, and much more. California Duck Days Festival officially begins with a welcome reception featuring an exhibit of outstanding wildlife art created by high school students of Yolo County and a display of the California Junior Duck Stamp contest winners. The reception is free and open to the public. California Duck Days tickets and T-shirts will be on sale. Drop by, see some beautiful art, participate in the raffle, and pick up information about the Festival. I can say everything about the blog and finding great knowledge and developing essay programs about communicative tips and thoughts. Useful https://gradesfixer.com/free-essay-examples/art/ site i ever seen and allowing great exams and online writing skills.